Posted on 4/15/2019, 10:48 am, by kittykill, under General Projects. Are you planning an Easter brunch this Sunday? Why not add something different to the menu with Blackstitches’ Cinnamon Pecan Scones. These tasty treats are filling and go perfect with a strong cup of coffee or tea. The scones also go fabulously with a peach mimosa. Take this pastry up a notch by adding fruits or other spices to the mix. 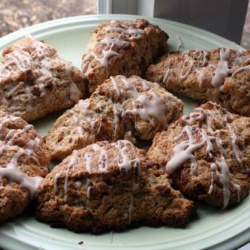 Cinnamon Pecan scones can be made any time of the year. Add a maple syrup drizzle for a fall themed tea party. If you are craving a cinnamon roll but don’t want the hassle, these scones are for you! Less mess with all the taste! Our Cooking Board has everything you need for your Easter dinner. Hop to it!